Returns an analog signal based on the intensity of a magnetic field. Also called: linear hall, magnetic hall, KY035, KY024. Found in kits: 20 sensors, 37 sensors, 45 sensors (analog only, small board). Found in kits: 37 sensors, 45 sensors (analog and threshold/digital, longer board). 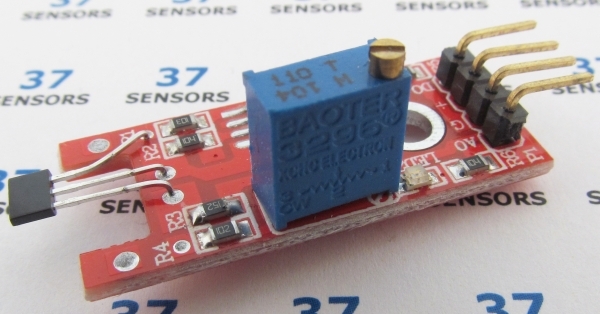 Sensor board has a potentiometer for sensitivity adjustment. Can be used for current sensing with appropriate circuitry. Use with a magnet for positioning. 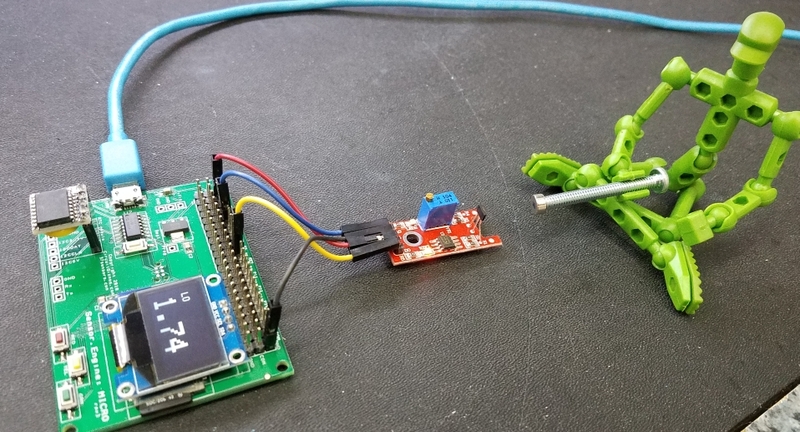 To demonstrate how this works, a test setup that uses the CircuitGizmos CGMICROKIT1 will be used. 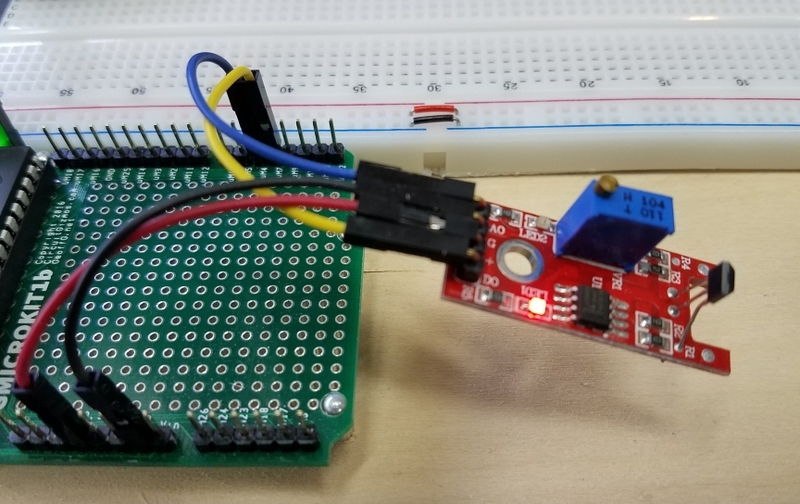 The CGMICROKIT1 has a microcontroller that connects to a PC via a USB/serial interface and runs an easy-to-understand yet powerful interpreted language. 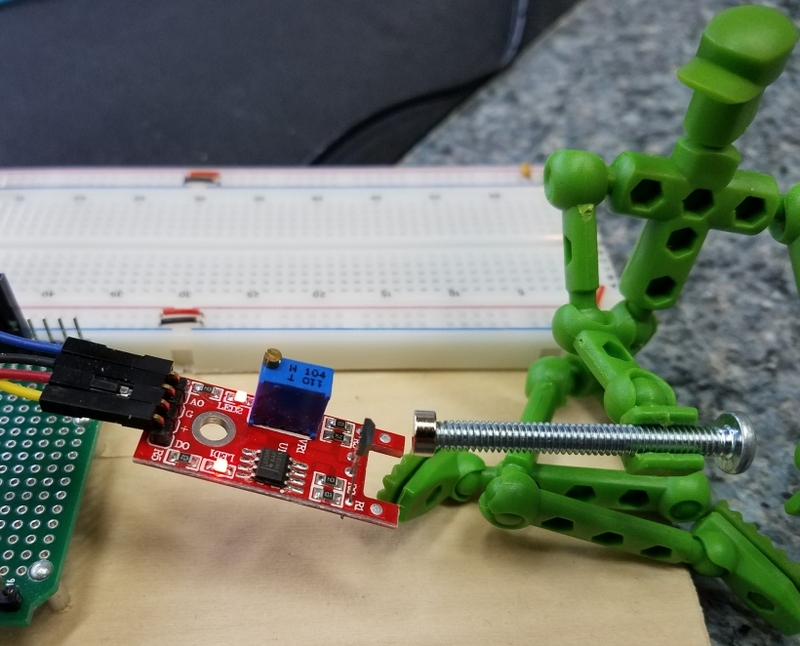 This setup combines a CGMICROKIT1 with a single solderless breadboard, a USB/serial interface to the PC, and a suitable power supply for a convenient test bed for proving out small circuitry and experimenting with these 37+ sensors. 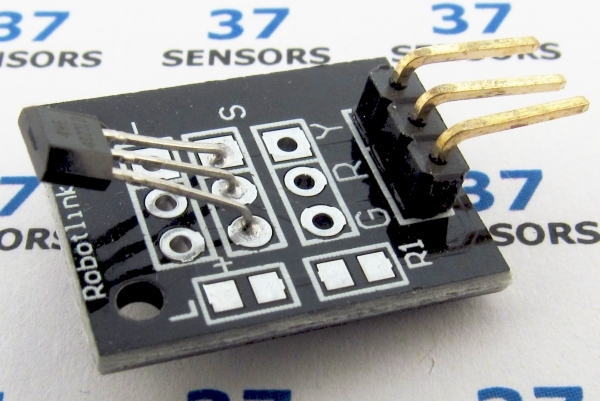 Read of analog Hall-effect sensor with CGMICROKIT1, console display. 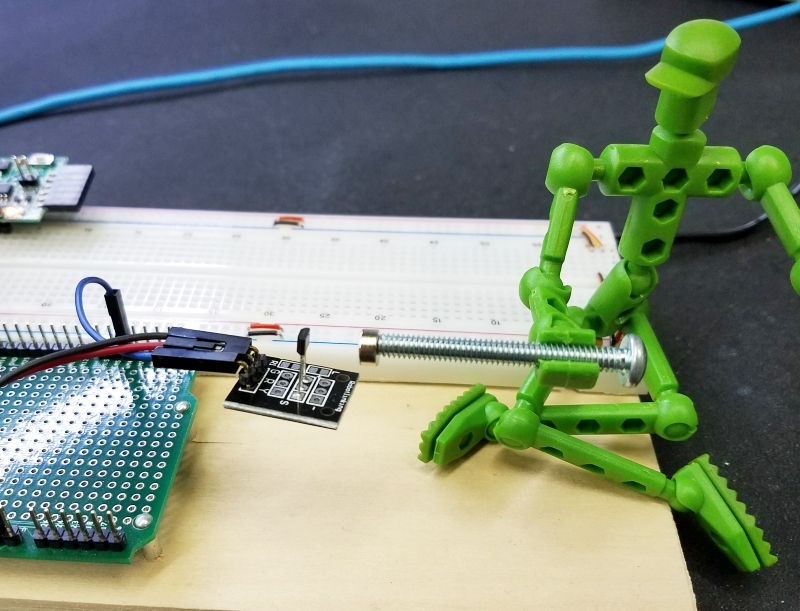 This test uses one analog input to read the sensor value every 200 milliseconds. The value is printed out on the console. Mo the maquette assists in holding the magnet near the sensor. 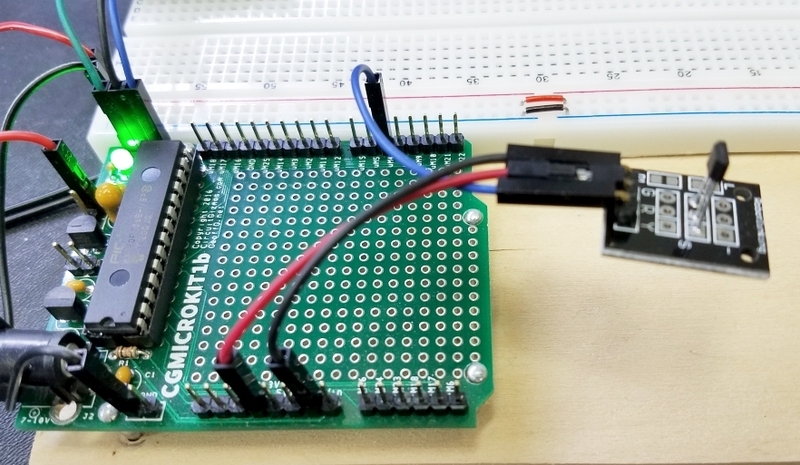 CGMICROKIT1 to analog Hall sensor connections. Line 1: Set pin 4 to analog input. Line 3 and 7: Loop forever. Line 4: Pause for 200 milliseconds. Line 5: Read the analog sensor input. Line 6: Print the value. Steady output without magnet present. My helper Mo moving the magnet around. Output with my helper Mo moving the magnet around. The output with the magnet will vary between a lower voltage (0.66V) and 1.72V (about half of Vcc of 3.3V) with one magnet orientation. Reversing position of North and South magnetic poles make the output vary from the quiescent 1.72 volts to a higher voltage (2.6V). 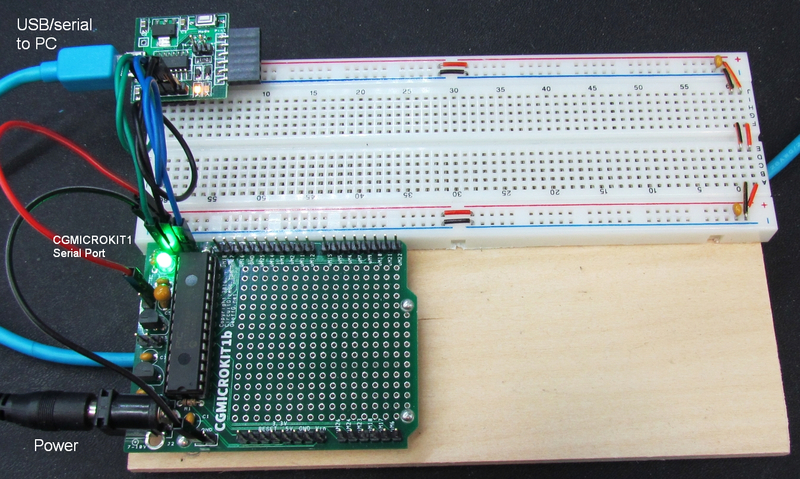 Read of analog Hall-effect sensor with CGMICROKIT1, console display. This test uses one analog input and one digital input to read the sensor value every 200 milliseconds. The value is printed out on the console when the threshold is passed, otherwise, no value is printed. Mo the maquette assists in holding the magnet near the sensor. 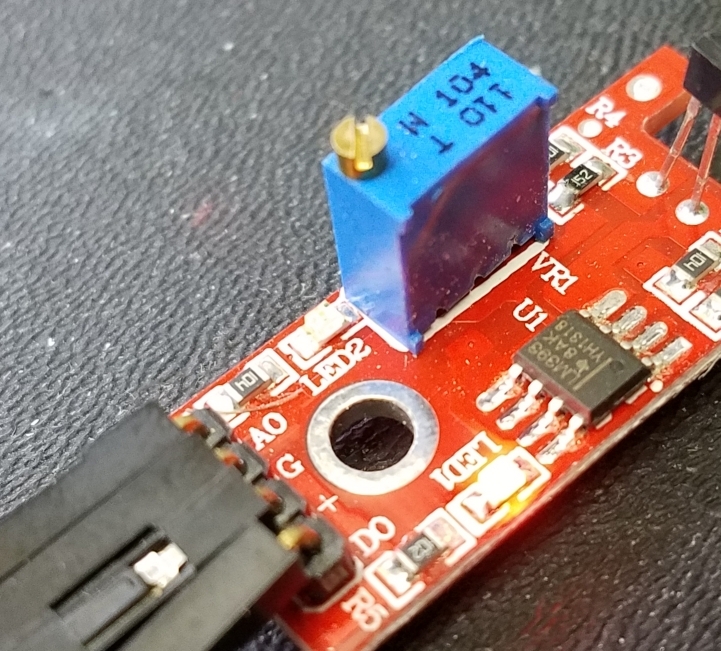 CGMICROKIT1 to linear Hall sensor connections. Line 2: Set pin 7 to digital input. Line 4 and 11: Loop forever. Line 5: Pause for 200 milliseconds. Line 6: Read the digital threshold input. Line 7 and 10: Test for threshold crossing. Line 8: Read the analog sensor input. Line 9: Print the value. No output with magnet farther away than the threshold. Mo moving the magnet around closer than the digital threshold. Output with my helper Mo moving the magnet around close to the sensor. Read of Analog Hall-effect with Sensor.Engine:MICRO, console display. Test 4 and 5 were performed with a CGMICROKIT1. The same tests can be performed with a Sensor.Engine: MICRO. 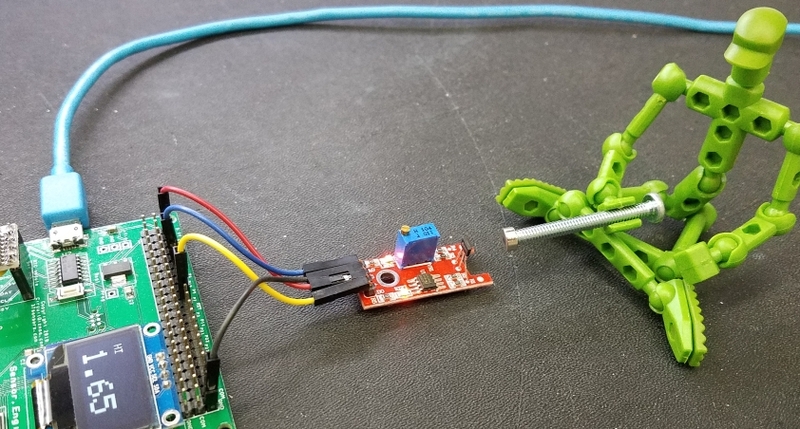 Read of analog Hall-effect sensor with Sensor.Engine:MICRO, draw on display. This test uses two analog inputs to read the X and Y values displays the joystick position on the S.E:Micro display. Joystick switch press clears the display. This test uses one analog input and one digital input to read the sensor value every 200 milliseconds. The value is printed out on the console when the threshold is passed, otherwise, no value is printed. Mo the maquette assists in holding the magnet near the sensor. Line 4 and 14: Loop forever. Line 7, 9, and 11: Test for threshold crossing. Line 8: Display “HI” for threshold = 1 on LCD. Line 10: Display “LO” for threshold = 0 on LCD. Line 12: Read the analog sensor input. Line 13: Display the analog value on the LCD. LED 2 is illuminated since the magnet has tripped the threshold. Here Mo has moved the magnet away from the sensor. Voltage = 1.74V. 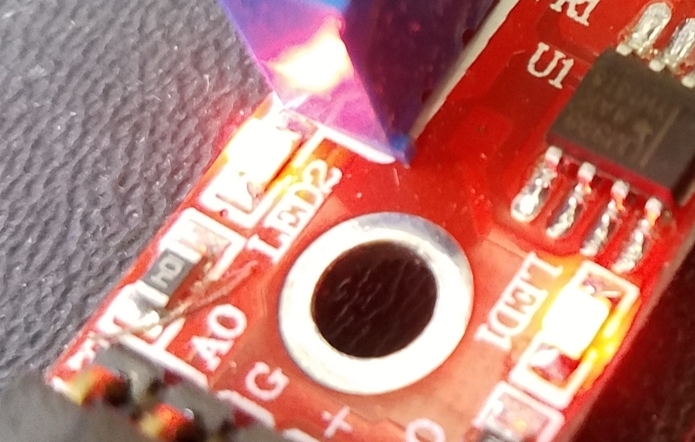 With the magnet too far away the LED indicates that the value is lower than the threshold. I gave him a small screwdriver and let Mo play with the variable potentiometer on this board. He was then able to change the voltage a which the threshold signal, and thus the LED, tripped.